Ever since the ‘demise’ of Sharon’s Laksa recently, I have been receiving comments, queries and mails asking about where to go for Siamese Laksa in Ipoh. 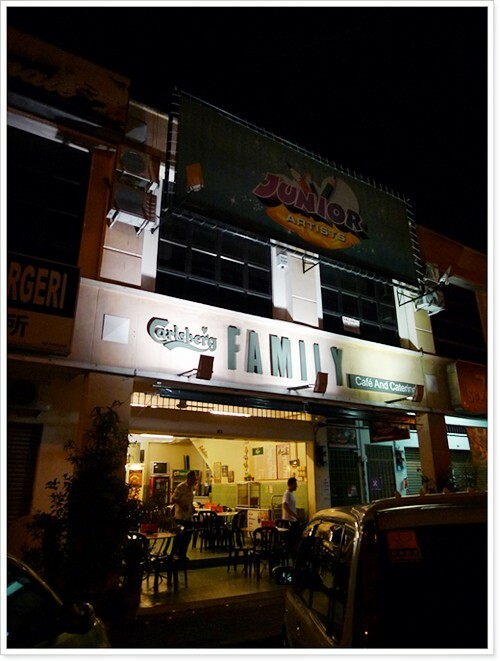 Most suggestions point to this place, named Family Cafe situated in Taman Ipoh Permai, off the main road from Jusco Kinta City leading to Tambun of Ipoh. I have tasted Family Cafe’s Siamese Laksa once (which is only available on weekends), before Sharon’s Laksa even came into the picture. Yes, I do agree that I prefer this type of richer, less sour and spicy, yet equally as satisfying bowl of laksa, than say, its counterpart the Assam Laksa, or Curry Laksa. So how did this bowl of Siamese Laksa at Family Cafe fare? 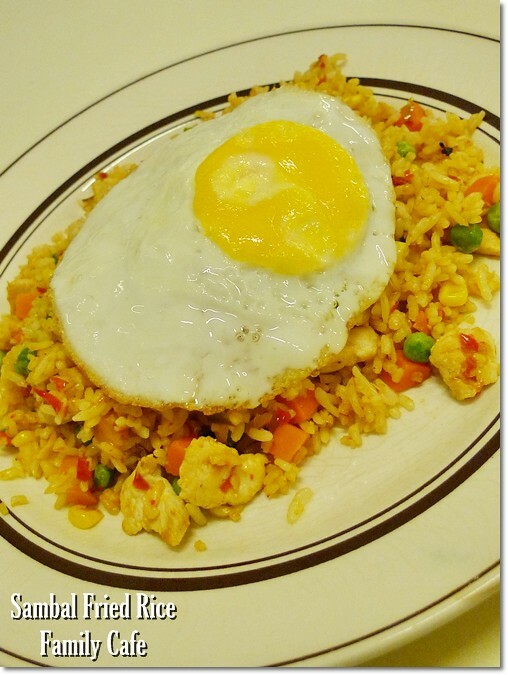 Read on …..
Family Cafe is certainly NOT new to the scene. Situated on the same row as Min Sin Yie Vegetarian Restaurant, right before you reach Citrus Wine & Dine on your right, this homely cafe has been around since about 4-5 years ago, if I’m not mistaken. We went there on a weekend’s night, and I was surprised at the rather poor crowd. We were the ONLY table there on a Saturday night (or Sunday, hmmm …. amnesia strikes again?!). The Siamese Laksa arrived in a mouth-watering and promising presentation, reddish with a slight orange hue, the broth reeked of fragrant coconut milk and spices, with mashed mackerel (was it mackerel?). Just like a bowl of delicious Siamese Laksa should look like. However, tastewise, the bowl of Laksa did not have the wow factor. Unlike the first time I slurped on Sharon’s creation, leaving me hankering for more. Don’t get me wrong here. Family Cafe still serves a decent version of the Siamese Laksa, but not the type that will get me craving every now and then. Even Mum agreed on this fact. Though to be fair even Sharon’s Laksa had their off-days back then, when the laksa came tasting almost uncannily like their Assam Laksa. Not creamy/rich enough to pass off as the Siamese/Nyonya variety. Siamese Laksa debacle aside, how about the other dishes served at Family Cafe? Sad to say, none that managed to appeal to us. 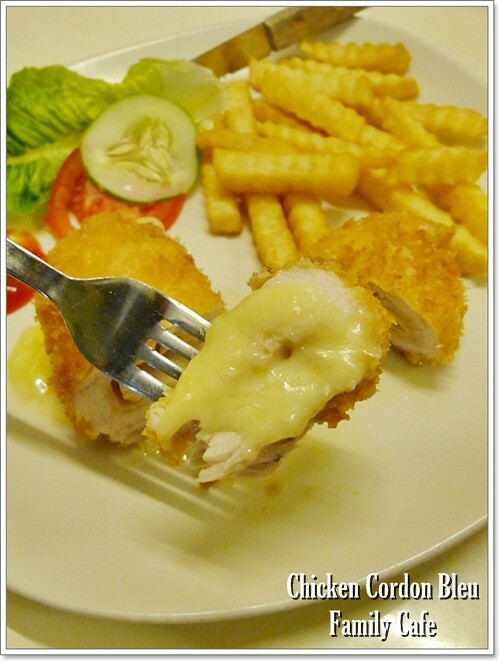 I vividly remember back then (about 3 years ago), I enjoyed their Cordon Bleu, served crispy on the outside with an oozing core filled with melted cheese and a slice of chicken ham. But this time around, not only was the portion smaller, but the cheese was bland and the whole ensemble was soggy, and very greasy. The Fish & Chips and Sambal Fried Rice did not succeed either. The former arrived in a batter that was too thick, though the dory fish was thankfully devoid of any unpleasant earthy/muddy taste. The Sambal Fried Rice was spicy, and that’s about it. A pale shadow of its old self? The empty premise on a weekend proved that they seriously need to buck up on the quality of their food. The meal was below average. Maybe I set my expectations too high? Or maybe that was one of their ‘off-days’? Whatever it was, this Family Cafe is certainly nothing like the Family Cafe I once knew back in their glory days. Anyone wants to share their experience with Family Cafe here, or anywhere else for Siamese Laksa that you want to recommend? A GOOGLE MAP to Family Cafe is attached. Ooh can’t say any of this looks too enticing. A shame! 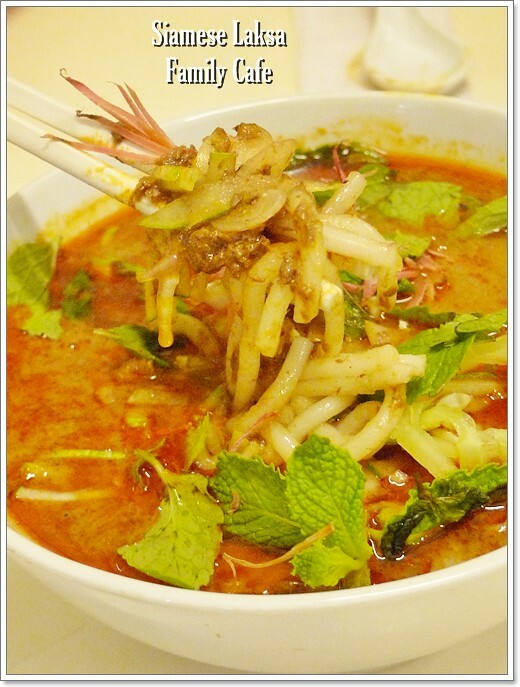 While we’re on the subject, I need to know where to get a slammin’ bowl of Siamese laksa in KL! Anyone?? Siamese Laksa in KL? No idea, really. But it’s hard to find even a good Assam Laksa in KL. Nyonya Laksa (or Curry Laksa) can be easily ordered in most cafe, but none that I know in particular that is outstanding. Makan time cafe at Kota Damansara. Yummy Siamese laksa. Only available on weekends, Family Cafe serves Siamese Laksa to cater to foodies here in Ipoh. 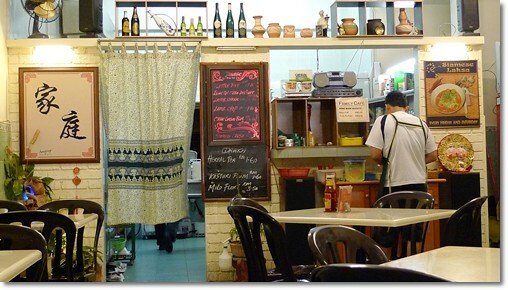 Previously, Sharon’s Laksa serves the laksa as well, but sadly has closed down…. check out that jimmy laksa. some random makeshift stall in front or perak timur coffee shop. operates thursday – sunday pm only . english speaking fler. I disagree with Tan, Jimmy laksa is not great at all. Also another case of “used to be good”. Thanks tan and poisonkagero for the information. Maybe I will check out this stall. In front of the Ipoh Timur? i agree with U, my friend highly recommended this place, in fact. It was last year, I went there, damn disappointed, coz both western n rice fried were bad! but no idea about the laksa….. The laksa sure looked impressive but looks can be deceiving at times right? 😛 It was until the end when I saw the front facade of the place did I realize this is just another bistro down the road… normal food, small portion and high pricing. I guessed only drinkers would frequent that place rather than normal diners now. Oh their lamb shank is good? Never tried that. Thanks. I was crossing my fingers in hope of finding a good Siamese Laksa there, but sadly ….. I remember the best tasting Siamese laksa was sold at the old Super Kinta food court. Can have bowls and bowls afterwards. Now, the second best Siamese laksa is one located at the Hollywood restuarant at the Canning Garden corner. Wait, Hollywood Restaurant got laksa stall?! Eh, never noticed lah. 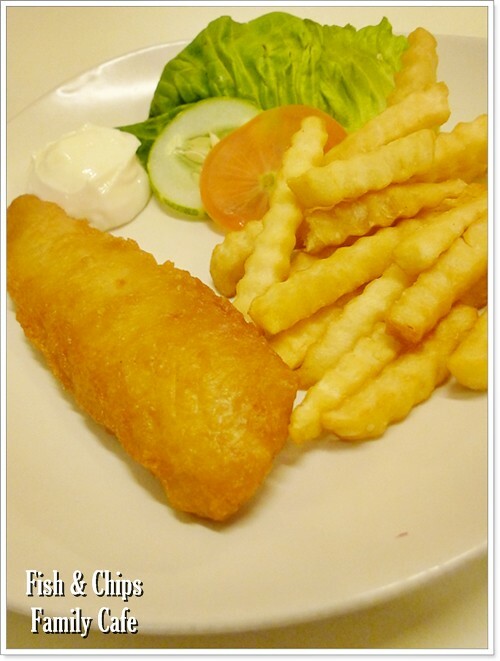 Usually have the Indian curry rice, nasi lemak, and of course… the various fritters. Oh yeah! I have put that Yum Yum laksa on my list for some time now. But sad to say, did not manage to try that. And now that it’s Friday only special, only makes things harder as I am in KL now. Makan Time cafe by Little Yum Yum in Kota Damansara. This cafe is the 3rd outlet branched from the famous Yum Yum Restaurant in Ipoh. They serve delicious Siamese Laksa. Just want to say that both shops – super kinta and canning gardens are Owned by my parents . They have retired over a decade. We have their Siamese Laksa at home now! Much to our delight. Thanks for agreeing that it is the best. They were the first to make it!